Finn's Toddler Room — Cassia & Co.
Finn's room has come together over time, and I'm very happy with how it turned out. We finally got a 'big kid' bed for him, so I thought I would take a few pictures to share. 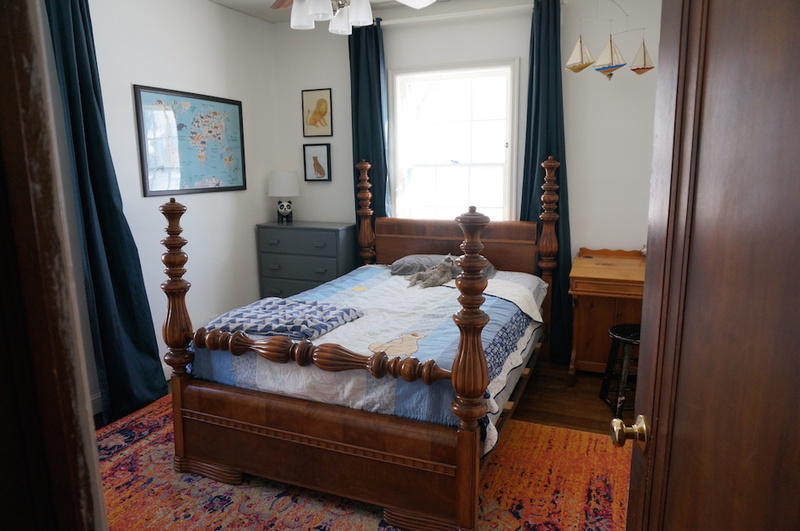 In case you would like to see how the room has come together, you can check out my previous posts—Design Inspiration for a Toddler Boy's Room and Progress Update–Finn's Toddler Room. I love that this room has a lot of pieces that hold special meaning to me. The bed frame my dad had refinished for me when I was a teenager, and I have always loved the style of it. Initially, I wanted a black iron frame bed for Finn, but I didn't want this frame to get ruined in the garage. I really like how it looks in his room, though, so it ended up working out. My grandmother made the quilt, and the triangle blanket is from Target (although it looks like they don't sell it in the navy anymore). It's so soft. The desk is an antique from my parents. Finn doesn't really use it right now, but I think it looks cute with his other stuff. I need to give that stool a sanding and fresh coat of paint. It isn't my preference to have the bed in front of the window the way it is, but it allows for the best flow of the room. It also makes opening the curtains much easier than how we had it before. The dresser was a Craigslist find a few years ago. I painted it a dark gray for Finn's room. I like that the art ties together the blues, oranges, and yellows from throughout the room. The Animal World Map (to the left in the photo) was on my wishlist for a long time, and I'm so glad I got it. Finn loves animals, and it is just a happy print. It's from Little Universe Shop on Etsy, and you can print it in a variety of sizes to fit your space. I found the Cheetah and Lion images via Pinterest and printed them at home to fit my frames. The panda lamp is from Target, and it still makes me smile every time I see it. 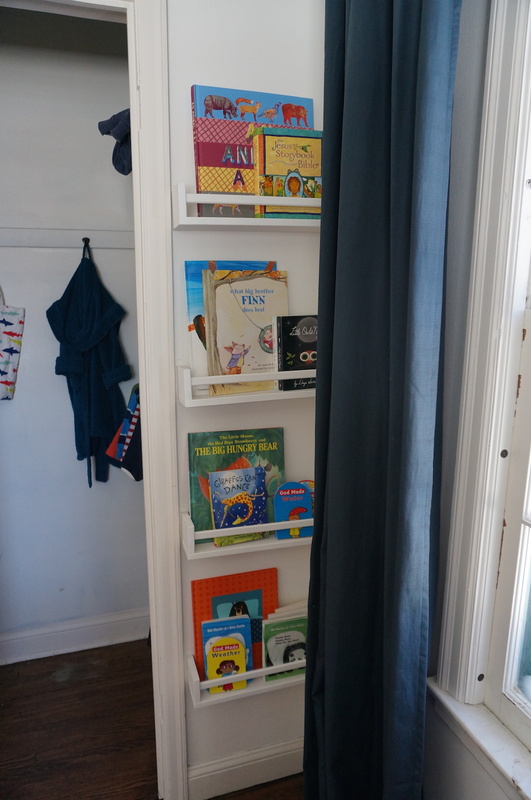 These Ikea shelves work so well for kid's books. I painted them the same white as the walls—Behr Polar Bear. The curtains are from Ikea as well. If you saw my post, Things Finn Says, you know he loves animals. We keep a few of his beanie babies in his room in this basket, and then we have two other baskets in the living room. He loves to play '5 Little Monkeys Jumping on the Bed' with them. The rug is from Overstock. It was in our office area at our last house. I probably wouldn't have bought it for this space, but the color works surprisingly well with everything I had already picked out for the space. The Sailboat Mobile hung over his crib at our last house. I like the sculptural element it adds to the room, and it gently spins when the furnace turns on. The rest of the art is a combination of thrifted pieces and prints I bought. 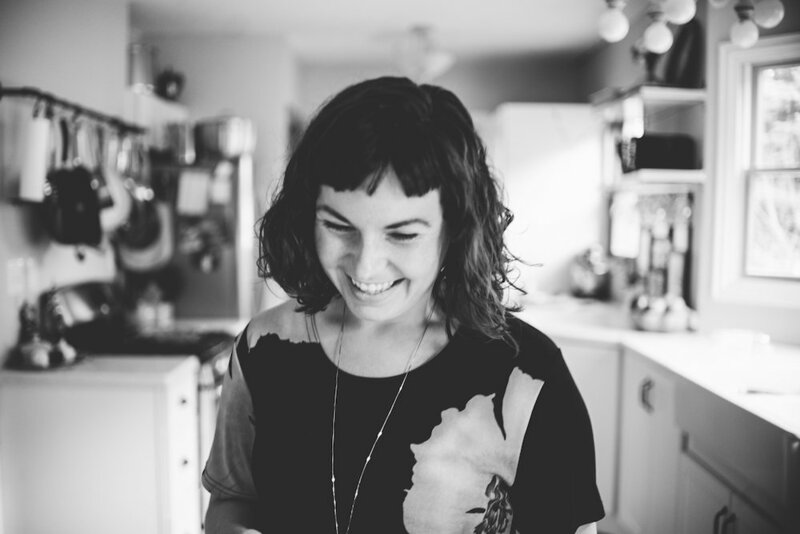 The Be Brave and Be Bold prints are from Minted. The 'Little Warrior' image, as I call it, is an image I found on Pinterest and printed at home. 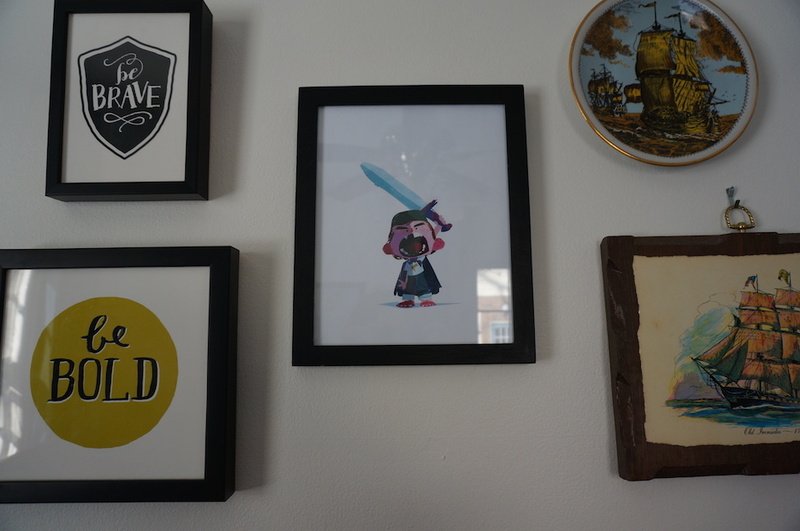 Finn's name means 'Little Warrior' so I thought this was a fun addition to his room.